News from LMCU: Santa Squad ready to spread the cheer! Santa Squad ready to spread the cheer! Look for those LMCU-blue Santa hats. That’s your sign that holiday happiness is in the air! 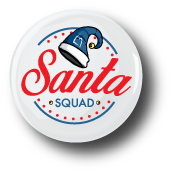 Santa Squad members will be spreading good cheer Monday through Saturday, all during the month of December! Check out LMCU’s social media pages to follow our Blue Santa Hat as LMCU ramps up glad holiday tidings. Visit our Facebook page to follow along!